I Really Need A Shower – In case you were wondering what that smell was a while back, well, I really needed a shower. I was told I could shower (but not take a bath) for at least three days after my operation. Reminds me of my college roommate’s personal hygiene schedule in a good week. The ShowerVine: And since I couldn’t bend over for anything that drops, I invented the ShowerVine. Ignoring the advance duct taping assembly for a minute, the cord expands to fit over any size shower head, then cinches tight so it doesn’t fall. The ShowerVine has a non-skid component so it won’t slide down the shower head when you tug on a bottle. It can easily add additional bottles, smaller bottles, travel bottles, spray bottles, umm, you get the idea. “Just What Do You Have There Buddy?” I get asked that a lot when I am at the pool. I explain it to the inquiring mind, then as they say, “Seems like a good idea,” they forget and leave their shampoo by the shower and go back to their locker. You can configure to suit your tastes by adding more bottles, spray devices, maybe even a clip to hold shaving cream. In the below picture I have my anti-chlorine spray. > First try and wear clothing (such as elastic waistband shorts) that you can easily pull up when you complete your toilet adventure. > Carefully lower yourself onto the seat using the support of your walker or toilet seat frame or grab bars. > Keep your surgery leg extended out in front of you. 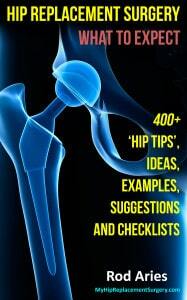 You will find out that keeping your leg straight will come quite naturally to you. > The safest way to clean yourself after a bowel movement is to stand and lean forward slightly onto your walker for balance while reaching around with toilet paper. > Despite what the Beatles’ song says, try not to twist your body or hip. > Keep your legs shoulder-width apart for steady balance. > When dressing your lower body, sit in an elevated chair or at the edge of your bed. > Be sure not to reach further than your knees while you are sitting. > Dress your surgical leg first. > Be sure to keep your surgical leg straight out in front of you while dressing. > First things first, you need permission from your doctor to shower. It will be based on your progress and how well your stitches are healing. > Your occupational therapist will demonstrate the correct technique so you can safely step into your shower stall or bathtub at home. 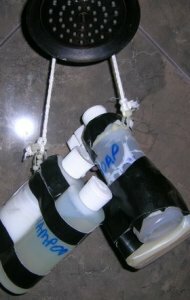 > Be sure your shower or bath has a safe grip for your feet. You can use non-skid strips glued to the floor or a non-skid rubber bath mat. Please make sure that the suction cups on the underside of the mat are pushed down against the floor of the tub or stall. > A long-handled bath sponge will help in bathing below the knees. 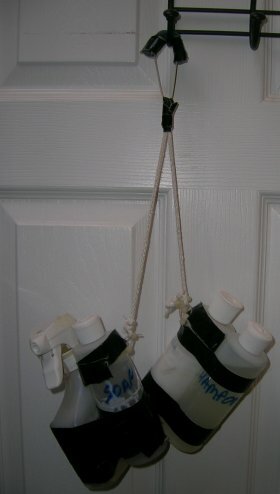 > Use the shampoo and liquid soap bottles attached via rope that we discussed earlier. Hip Tip – The Bathroom Is The Most Dangerous Room In Your Home: Under normal conditions your bath tub and shower are dangerous. When you factor in a recovering hip combined with a wet shower floor, that small lip leading into the shower and all those little wet spots you create when you drip dry, the bathroom is even more dangerous. Be Incisive About Your Incision – The shower was predicated upon the would healing and that there was no signs of drainage. Your doctor will instruct you how how treat your incision. Always leave your wound dressing in place while showering. Afterward, you can remove the dressing, dry completely and apply a clean dressing. Mostly try to keep your scar area dry. If your incision gets wet, carefully pat it dry. Apply no creams or lotions to your scar other than an antibacterial lotion. More Post Surgery Baptism Rules – You may not immerse yourself in any water, other than your shower at home, for up to six weeks after surgery. The list of precluded bodies of water include the pool, hot tubs, lakes and even bath water. The goal is to keep germs and bacteria out of the scar area. An Ounce Of Prevention – Hand washing is your number one activity to prevent infections. Please make sure you and your caregiver wash your hands frequently, especially when attending to would care. Go to your local drug store and buy a hand sanitizer lotion bottle. Hip Tip – Fido Isn’t As Clean As He Looks: Wash your hands after touching any pets. Tigger’s cat litter box or Fido rolling on the dirt outside can be a sneaky source of germs. In short, if you are religious, trust your God, but wash your hands. Alrighty… that concludes Chapter 30.